If you're a muscle car fan, now is the perfect time to head down to your local Dodge dealer serving Albuquerque Los Lunas Santa Fe. The 2019 Dodge Challenger models will be on full display, including the exhilarating SRT Hellcat. You'll love the Challenger Hellcat's high level of driving excitement and retro styling. Spacious seating also gives this high-powered coupe another big advantage over the competition. Whether you're cruising along the interstate or making a pass down the dragstrip, expect to have a blast. An array of advanced safety technologies take the Challenger's appeal to the next level. When looking at the 2019 Dodge Challenger, you'll immediately notice its retro styling cues. Many of its features were taken directly from the original model, which first hit the scene more than 40 years ago. 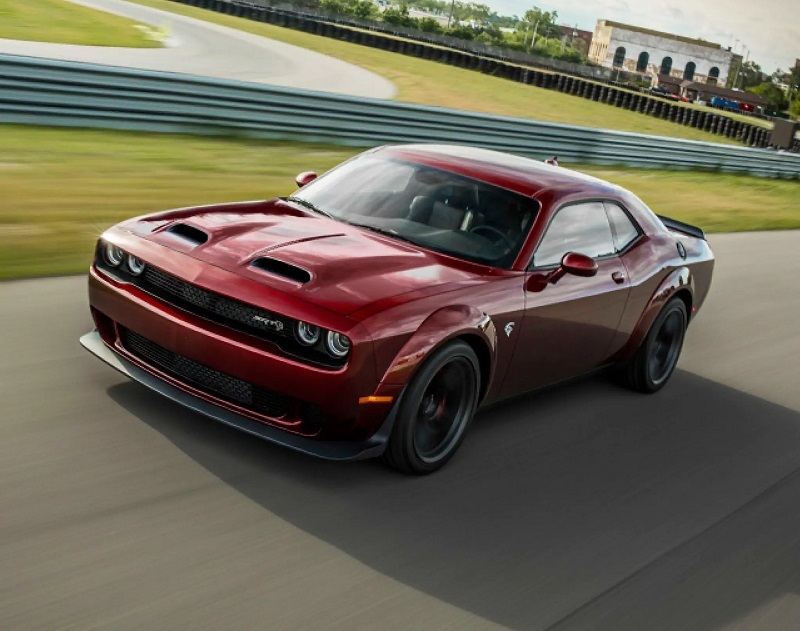 Like a classic muscle car, the new Challenger Hellcat has a powerful presence. It simply dominates the street. Everyone on the road will respect the coupe's signature front fascia. Round headlights help the Challenger Hellcat to leave a lasting impression. For 2019, Dodge has further bolster the car's curb appeal by adding a new dual snorkel hood. Aside from giving the Challenger Hellcat an extra intimidation factor, it also adds more horsepower by improving airflow into the engine. Several cool touches are found on the rear as well, including throwback LED taillights and a powerful rear spoiler. While even the standard SRT wheels will catch your eye, several optional wheel packages are available. The new "Devil's Rim" forged wheels definitely make a bold statement. Available Mopar racing stripes add even more flair. Some of the enticing paint colors include Go Mango, B5 Blue Pearlcoat, F8 Green, and Yellow Jacket Clearcoat. You local Dodge dealer serving Albuquerque Los Lunas Santa Fe welcomes you to come tour the new Challenger Hellcat! The 2019 Dodge Challenger SRT Hellcat is designed to provide pure comfort on the road. Class-leading passenger room enables your friends and family to join the action. A big trunk also makes the Challenger Hellcat the perfect muscle car for taking long road trips. Optional Demonic red seats give the interior a special touch. Ventilated seats are available as well. While the 2019 Dodge Challenger SRT Hellcat promises to provide a relaxing atmosphere, you can't overlook its high-performance nature. 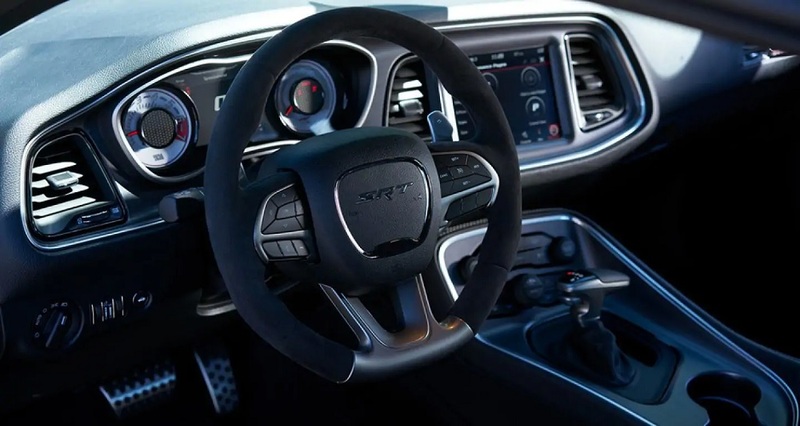 Race-inspired SRT gauges and a flat-bottom steering wheel make you feel in total command. High-tech goodies give you more reason to love the Challenger Hellcat. Dodge's 8.4-inch Uconnect touch screen promises to leave you impressed. Not only does this award-winning interface provide Apple CarPlay and Android Auto smartphone integration, but it also provides Performance Pages. You'll be able to quickly access exciting performance data like acceleration times and braking distance. While the standard Alpine stereo system will satisfy most music fans, others will not be able to resist the amplified Harman Kardon surround-sound system. Some of the other highlights include a 4G Wi-Fi hot spot, remote ignition, and SiriusXM Traffic Plus. 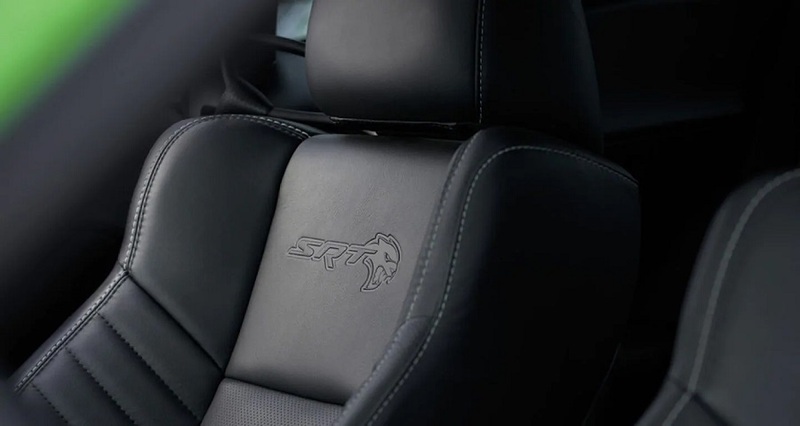 To learn more details about the Challenger Hellcat's optional equipment, be sure to contact your local Dodge dealer in Albuquerque New Mexico! While the 2019 Dodge Challenger SRT Hellcat is built to captivate driving enthusiasts, superb ride quality makes it comfortable enough to drive on an everyday basis. A sports-tuned adaptive suspension enables the Challenger Hellcat to soak up the road like a luxury car. However, activating the "Track" driving mode takes the big coupe's handling to the next level. Many Challenger fans will be interested in the optional Widebody package, which allows the installation of beefier performance tires. While the Challenger Hellcat is a beast on the street, it's also a dominating performer at the track. By limiting wheelspin, launch control technology helps you to race past the competition. 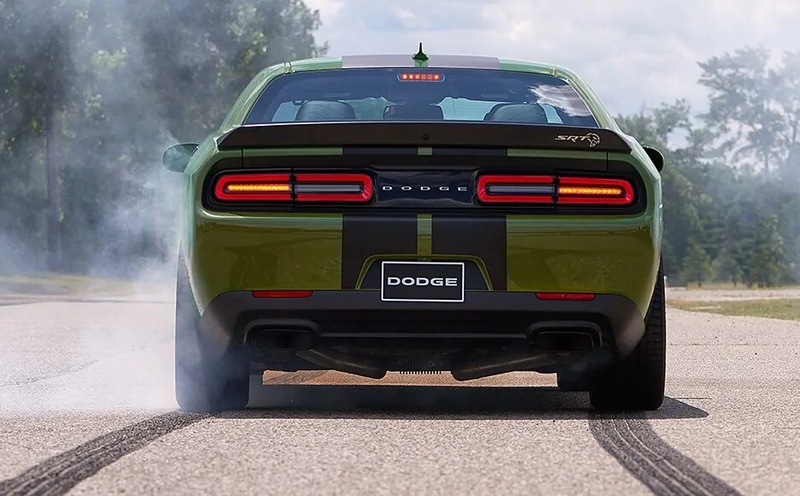 Meanwhile, and active exhaust enables the Challenger Hellcat to sound ferocious. If you live in in Albuquerque New Mexico, make it a priority to come experience the excitement of the Challenger Hellcat. Expect the new Challenger Hellcat to deliver world-class performance. Resting under the hood is a supercharged Hemi V8 engine, which now features an exclusive After-Run Chiller. Dodge tuned this monstrous engine to develop an electrifying 717 horsepower and 650 pound-feet of torque. While the six-speed manual gearbox is thrilling, you'll find the TorqueFlite eight-speed automatic transmission with manual mode to be just as fun. You'll likely become addicted to the Challenger Hellcat's blistering acceleration. It can easily hit 60 mph in less than four seconds. On the track, the Challenger Hellcat also recorded a top speed in excess of 200 mph! No other muscle car in Albuquerque New Mexico can deliver as much driving excitement. The Challenger Hellcat's performance capabilities are well known. However, great crash protection also makes the Challenger Hellcat ones of the most secure cars in the segment. It comes loaded with a long list of valuable safety technologies. While a ParkView backup camera helps you to move in and out of tight spots, six-piston Brembo brake calipers ensure the maximum stopping power. You also have access to some important driver-assist technologies, including forward collision warning and adaptive cruise control. For more facts on the Challenger Hellcat's safety and security features, be sure to contact your local dealer serving Albuquerque Los Lunas Santa Fe. Come experience the 2019 Dodge Challenger!